This excellent relief, carved with good depth using Bangai wood, one of the rarest kind of timbers used for class-carving, in its natural colour, represents a celestial damsel, perhaps an ‘apsara’ – nymph, a denizen of the court of Indra, the king of gods, or a dancer by divine birth, putting on a string of bells or an anklet on her feet. 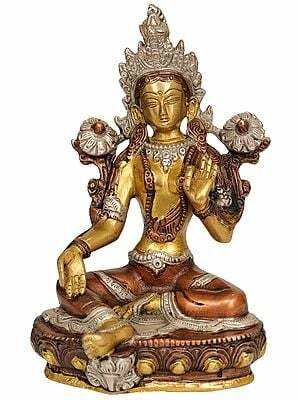 The artist has sought to reproduce in wood an icon of medieval beauty pursuing the same aesthetic and iconographic standards as pursued the sculptors creating Khajuraho-like temples, or the medieval metal casters of the Chola and Pala like finest Indian bronzes. Wood, a difficult medium not allowing any re-doing : patching or re-casting, has been manipulated to yield gold's plasticity and lustre and the softness of wax to reveal a marble-statue’s finish and absolute anatomical proportions appropriate for a maiden with celestial origin. Whatever the size of the image, its life-like vigorous beauty inclines the eye to believe that the damsel shall eject and would begin dancing any moment. Every form and detail has been so carefully and precisely carved, and life breathed into, that it becomes difficult to believe that what stands transformed into a celestial anatomy is an ordinary log of wood. 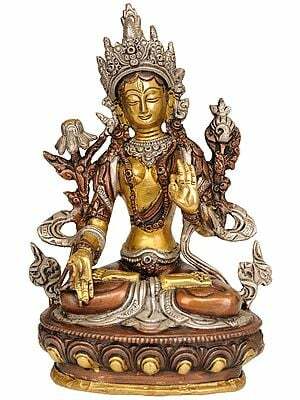 The statue combines the skills and arts of jeweller and aesthetician, one endowing it with gold ornament-like finesse and details, and the other, its unique figure, perfect proportions, all her bewitching charms and transcendental beauty. Temple-walls at Khajuraho, Konark and many other places have sculptures with identical theme, great plasticity and rare beauty; however, being a subsequent work and with other models and ideals of beauty in perception, this wood-piece marks a subtle improvement over its stone and metal counterparts. As ordained by ancient masters of Shilpa-shashtra – aesthetics and iconography, the artist of this wood-relief seems to have had in mind that beauty did not confine to mere face but enshrined the entire figure, poise, gesture, curves, emotional bearing and the total anatomy. He also seems to have had in mind the traditionally venerated standards of feminine beauty : voluminous hips, subdued waist and far more subdued belly, rounded well-protruding breasts contained by a beautifully worked ‘stana-patta’ – breast-band, tall slender figure, bow-like arched eye-brows, large emotionally charged eyes, a sharp nose, small alluring lips cradling a mind smile on then, round face with glowing cheeks and well aligned chin, long fingers and nails and well-defined neck. The artist has modeled his dancer in exact pursuance of these high parameters of beauty. A perfect anatomy apart, greater beauty reveals in the figure’s poise : in her act of putting on her anklet, which delightfully twists her entire figure : the left hip protruding and the right recessing; lean belly tilting to right creating on the left a crescent-like semi-circular form with the left breast forming its upper ridge; and, the breasts : focal point of the entire sculpture, fascinatingly moulded and brilliantly clad as they are, dominating the figure’s total anatomy. The face is tilted a little to her left aligning to diagonally angled arms, and this rhythm of arms and face descends with alike thrust also into the legs and the pleats of ‘antariya’ that covers them.